Surgery can be expensive, scary, dangerous and even deadly. Yet it’s hard for patients and even for referring physicians to navigate the system. So I was intrigued when I was contacted by Dr. Arnon Krongrad , CEO of Allevion, Inc., a healthcare logistics company that markets surgery packages. The company’s Surgeo online marketplace let’s patients shop for the surgeon of their choice. I explored the topic in depth with Dr. Krongrad in this email interview. What are the limitations of referrals to surgeons by primary doctors? Conventional surgeon referrals by other doctors, such as primary physicians, rely upon limited knowledge about a limited number of surgeons. For example, primary physicians tend to know a relatively small handful of surgeons for specific procedures, such as vision correction. The simple reality is that in today’s environment, when primary doctors are pressured to churn patients, type into EMRs, and speak ICD-10, they have little time to sort through choices of surgeons. They will reflexively refer to the familiar, which may or may not be optimal. Primary physicians, like the rest of us, might welcome systematic, easy access to knowledge about choice of surgeons. It looks like your surgeons are selected based on the opinions of their peers. 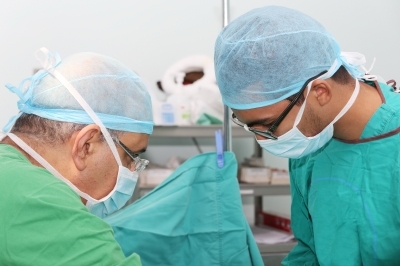 Are there more objective, quantitative ways to rate surgeons? Surgeo’s purpose is to simplify access to quality care. In surgery, quality comes from the surgeon. The question, then, is how to qualify surgeons. This is an urgent question as our increasingly consumerist ecosystem demands transparency regarding cost and quality. It is a question with obvious and easy answer but a conceptual framework will help us to manage and make progress. First of all, no, there are no objective, quantitative ways to rate surgeons. We should be clear. We are not talking here about waiting room times or adequacy of parking. We are talking here about clinical quality: blood loss, rectal perforation, positive margins, and the like. A system that has not produced an objective, quantitative way to transparently, uniformly, and broadly present cost – a much more cleanly quantifiable dimension of care – has only just begun to think about objective, quantitative ways to present surgeon quality. As we think about surgeon quality, we should recognize that surgeons do not operate in a vacuum. Most critically, they operate on patients, who are varied, and produce outcomes that are varied. Let us use prostate cancer surgery as an example. The factors other than surgeon skill that affect various outcomes vary. For example, cure is affected by cancer grade and preservation of erections is affected by diabetes. So which outcome – cure, erections – are we looking at when we ask about surgeon quality? Once we decide, have we collected patient data in a way that would permit us to explain variation in outcomes between surgeon A and surgeon B? No, we’re just not there yet. There are data, most notably in bariatric surgery, to show that subject expert peer credentialing correlates with objectively measured outcomes, such as hospital readmission. In other words, we think we can do well by patients and payers by applying the collective, subjective wisdom of surgeons. Do other factors affect surgeon qualification? Any surprises? Yes. Surgeo’s surgeons are qualified using a published, multi-factorial surgeon credentialing process that includes but is not limited to peer input. The idea is to try to get as close as possible to surgeons who know what they are doing and who exemplify the high standards of service and mission. The additional steps have yielded some surprises. For example, Surgeo recently rejected the application of a very well known, very high volume, well published surgical specialist whose peers think highly of him. We rejected the application upon discovering what his peers did not know: that he has a history of numerous high-dollar malpractice payouts, including one incomprehensible loss at jury trial. This example relates to the opening comments: doctors do not investigate surgeon qualifications as fully as they might if given motivation and time. Surgeon qualification takes time, effort, and more than one criterion. What do surgeons think of your approach? Doctors generally are under siege. They are all looking for simplicity, fairness, and respect for their abilities and integrity. Surgeo delivers those and surgeons love the surgeon-driven, clinically rational product design and administrative approach. The model works because it satisfies patients and providers. It has also satisfied payers, as when we used it in a previous chapter to satisfy Blue Cross and develop surgery bundles for the network. What has been the most surprising reaction of your surgeons? Surgeons are often paralyzed by the freedom that Surgeo offers. They have no idea how much to charge for their services because nobody has ever asked them before. Surgeo does not negotiate prices with its downstream vendors. Surgeo does not set allowed amounts or ask for discounts. This is unfamiliar to most doctors. This seems bizarre. Have you ever met a lawyer who has no idea what his hourly rate is? What’s the history of Surgeo? What is its future? One day, two things happened: Congress said everyone was getting healthcare and a man with cancer told me he could not get healthcare: surgery for his newly diagnosed cancer. I tried to help him and ran into inflexibility and apathy. The solution ultimately involving sending him from Oregon, my surgical team from Florida, and a surgical robot spot purchased on eBay for 1% of retail from Colorado to an operating room in Trinidad. The exercise delivered a flat-fee surgery package at a price he could afford and worked for all involved. We then developed the model domestically and sold surgery packages to individuals and large payers. You can see a presentation of that case here. Surgeo is a public, interactive, online face of surgery packaging and pricing software engine that was designed in-house under the direction of Kimberly Langer, our Chief Product Officer. Kim was formerly with a large payer, where she designed large enterprise claims related software. She built Surgeo to scale in a way that can work with payer EDI streams for easier network integration and for presentation to members of service choices and out-of-pocket costs. Kim also built it to accommodate our customers who want privately labeled software by which to market their own surgery packages. We’re seeing demand for that from financial and provider organizations. You cover a variety of surgeries. Are there any surgeries that have been more popular than expected? Penile implant surgery. We did not even think about this when we first set out. It turns out that there are huge problems related to this procedure. First of all, authentic conversation about male sexuality and erectile function is in very short supply and men with diabetes, cancer, and other conditions associated with erectile dysfunction have very few places to turn for substantive learning. Secondly, the pharmaceuticals for erectile dysfunction have taken over the airwaves and displaced much of the conversation about other, very effective treatments. We were amazed, for example, that one national network of diabetes activists, whose constituents have up to 70% prevalence of erectile dysfunction, has not discussed erectile dysfunction in 10 years! What makes the challenges even greater is that penile implant surgery is often not covered by payers. We hear regularly from patients who thought they had what they call “really good insurance” that penile implant surgery is not covered. The way things are going, with CMS having dropped covered for vacuum erection devices, it won’t surprise us if penile implant surgery is just uniformly dropped. We are getting sad, pleading calls from men with diabetes, obesity, cancer, and others who would like to restore their erections, relationships, marriages, and mood. These men are finding a delivery system that is broadly opaque and unhelpful. In response, we built in response is a national penile implant surgery package network. It features peer credentialed surgeons, comprehensive flat-fee packages, finance navigation, and financial protection in the event of complications. It offers plenty of choice. The risk protected, flat-fee penile implant surgery package network is a model for efficient delivery of non-covered services. It can help payers to help direct members who do need those services. What do you mean by financial protection in the event of complications? Surgeo packages protect surgical patients against financial surprises by bringing in qualified surgeons. This is not a guarantee of elimination of complications but it helps. The second protection is inclusion in the flat-fee package of ancillary procedures. For example, gastric sleeve surgery includes hiatus hernia repair if it is needed: no surprise bill. In some cases, such as penile implant and laparoscopic hysterectomy, we are able to also include third-party products that take financial responsibility in the event of surgical complications. Think of it like getting collision insurance when renting a car. What explains the variations in package prices? We are just now starting to see a geographically distributed free market of uniformly defined surgery packages. Surgeons in Houston are looking and seeing prices in Birmingham and adjusting accordingly. So some of the variation is explained by the absence of a transparent market. Variation will probably shrink as price transparency sets in as it has on Surgeo. We see surgeons routinely not wanting to the most expensive.